Dr. James M. Cottom Offers A New Option in Treating Chronic Heel Pain. A New Procedure May prove to be better than the existing standard of care. Dr. James M. Cottom, one of Florida’s foremost foot and ankle surgeons, has been offering treatment of chronic plantar fasciitis with a new arthroscopic technique. The procedure uses two very small incisions similar to knee and ankle arthroscopic surgery to treat heel pain that has not responded to conservative treatments. Plantar Fasciitis is commonly defined as a painful inflammation of the connective tissue on the plantar surface (bottom) of the foot. This condition affects 10% of all of adults over the age of 30 (Riddle 2003, Toomey 2009). Plantar Fasciitis is more typically diagnosed in women and the obese (Tomczak and Haverstock, 1995). Most patients present with debilitating chronic pain and symptoms (Jariwala, Bruce, et al 2011). Current treatment options consist of NSAID’s, steroid injections, physical therapy, orthotic devices, splinting and in cases that do not resolve, surgical release of the Plantar Fascia (Medical Disability Advisor, 2010). The latter is a complete and irreversible disruption of the ligaments using techniques such as, but not limited to, those described by Schon, DuVries, and Baxter. Surgical intervention has been deemed necessary when conservative non-operative treatments are unsuccessful (Faraj and Querishe, 2002). 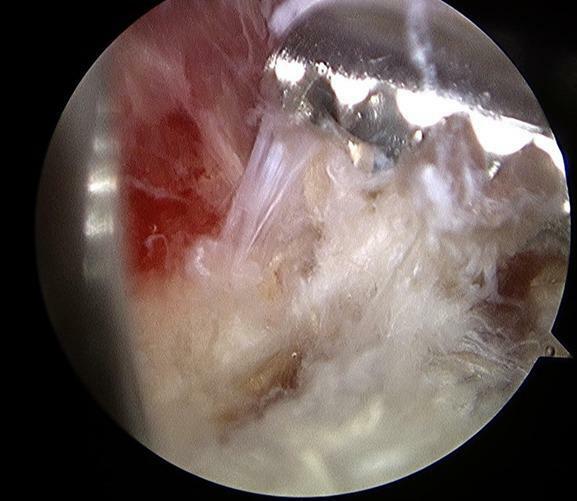 An alternative response to the aforementioned treatment modalities has been developed as a minimally invasive debridement arthroscopic surgery technique. Patients are prepped and draped for surgery with pneumatic tourniquet applied to the thigh. 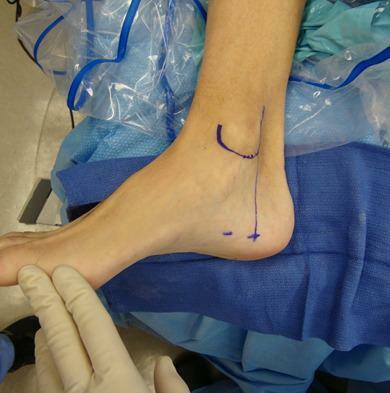 A medial portal along the medial plantar fascial space was made using a #15 blade and trocar. A medial portal posterior was also made. The arthroscope was introduced through the medial anterior portal into the subcalcaneal space. 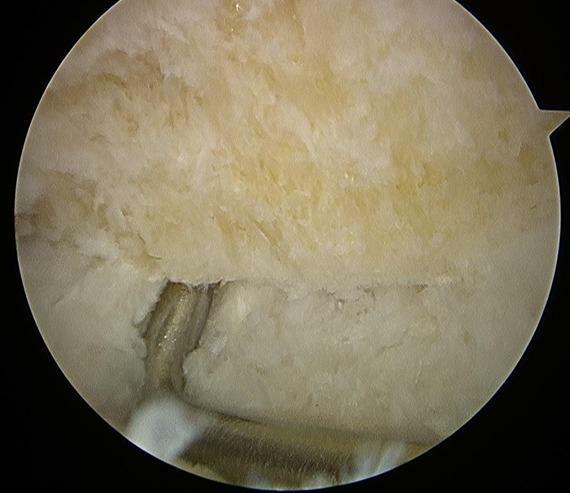 An initial direct evaluation was made with the arthroscope. Next arthroscopic instrumentation is introduced in the retro-plantar calcaneal space in order to perform a bursectomy. Then the plantar fascia tissue is debrided, debulked and thinned out to physiological thickness. This is necessary to remove the thick fibrous scaring in order to allow proper elasticity of the ligament during and after post-operative rehabilitation. In most cases a plantar heel spur is identified radiographically and arthroscopically. If present the spur is shaved to return the bone to its normal contour. Post-operatively patients are placed in a walking boot and are able to resume weight bearing 3 days after the surgery. They then began formal physical therapy between 2 and 3 weeks after the procedure. Dr. Cottom is currently working on a prospective study on this new technique following 46 patients who are at least 1 year out from the surgery. Preliminary results are very promising and the data is pending publication. Arthroscopic Instrumentation inserted for debridement of the ligament and removal of the heel spur. After final debridement and resection of the heel spur. Note the probe is between the bone and origin of the Plantar Fascia. The ligament has NOT been cut.